When you think of the arid landscapes of the southwestern United States, water might not be the first thing that comes to mind. But southern New Mexico, Arizona and Texas abound with majestic rivers that are not only critical sources of water to human populations, but lifelines to other land and water animals. Not all of these southernmost rivers flow year round, or even some years at all, but when they do, they can be considered among the mightiest waterways in America. Some fish inhabitants of these southern waters are found nowhere else in the world; many of them face uncertain futures plagued by drought, dams, and extensive water diversions. Here we take a closer look at three amazing international rivers that cross the U.S.-Mexico border and meet a few truly unique fish that call this entrancing landscape home. 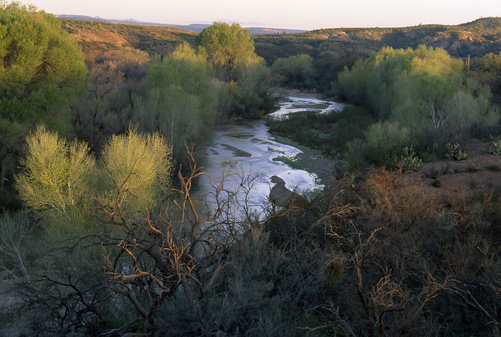 The San Pedro River crosses the U.S.-Mexico border not once, but twice! Beginning in the foothills of the Sierra Madre Mountains, Mexico and flowing north, the San Pedro joins the Gila River near Phoenix, Arizona, meets the Colorado River in Yuma, and ultimately flows into the Sea of Cortez. If you think that is neat, the nearby Santa Cruz River, also a tributary to the Colorado River, crosses the border three times! The San Pedro Riparian National Conservation Area protects over 55,000 acres of public land and riparian woodlands, lauded as critical habitat to migratory birds, over 80 mammals, and of course, fish. Many San Pedro River fish are federally endangered or threatened including Loach Minnow (Tiaroga cobitis), Gila Chub (Gila intermedia), Colorado Pikeminnow (Ptychocheilus lucius), Gila Topminnow (Poeciliopsis occidentalis), Spikedace (Meda fulgida), and Desert Pupfish (Cyprinodon macularius). 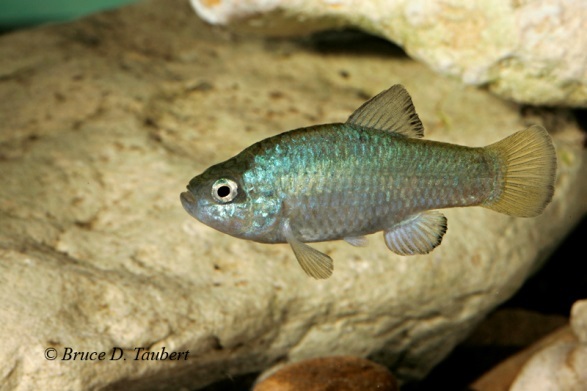 The Desert Pupfish occupies scattered and isolated lake and riparian habitats in the southern United States, in addition to portions of the San Pedro watershed. It is uniquely suited to the variable, often extreme, conditions of the region; oxygen levels less than 0.1 parts per million, salinities twice as high as the Pacific Ocean, and a temperature span as wide as 40 to 100o F are another day in paradise for this North American cyprinid. As a species, they respond quickly to climactic cycles; their population expands rapidly in number to occupy newly available habitats in wet years, and contracts in dry years. The desert pupfish is an endangered species, strained by water diversions and pollution on top of naturally fragmented distributions. Healthy sub-populations are said to thrive in parts of the San Pedro, where a patchwork of protected lands and conservation areas help maintain verdant riparian habitat, a green interstice in southwest desert terrain. The Sonoyta River begins near Sierra del Pozo Verde in Mexico before flowing northwest to Sonora, where it runs along the US-Mexico border in Arizona. A portion of the Rio Sonoyta’s headwaters are in Pima County, AZ, which flow south across the border into the Mexico mainstem. Rio Sonoyta, which is thought to have historically been itself a tributary to the Colorado River, today empties into the Sea of Cortez. The river is home to the endemic Sonoyta Pupfish (Cyprinodon eremus), indigenous Longfin Dace (Agosia chrysogaster), and also the Sonoyta Mud Turtle (Kinosternon sonoriense longifemorale). Like so many border rivers, drought and water demand have dewatered long sections of aquatic habitat, calling for further conservation measures to secure a place for these one-of-a-kind animal populations in our nations’ future. The Rio Grande, the second largest river in America, originates in the Colorado Rockies, traveling over 1,800 miles before reaching the Gulf of Mexico in the city of Tamulipas, Mexico. Today, only about 20% of Rio Grande water makes it to this final destination, as its serves to irrigate agricultural lands and quench urban centers. The Rio Grande has lost ⅓ of its fish diversity due to heavy pollution, water diversions, canalization, and habitat conversion. But in the Lower Rio Grande Valley National Wildlife Refuge, healthy and federally protected riparian corridor provides lush, green (and blue) sanctuary habitat to diverse and charismatic wildlife like Jaguarundi and Coati. Water conservation along the Rio Grande could help restore fish species endangered or thought to be extirpated, such as the Rio Grande Bluntnose Shiner, (Notropis simus simus) or Rio Grande Silvery Minnow (Hybognathus amarus). 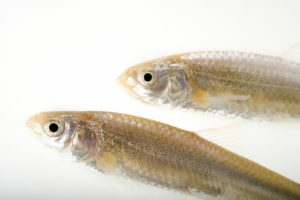 The Rio Grande Silvery Minnow may look unassuming, but some say it swims with the fate of the entire river on its back. Once the most abundant fish in Rio Grande, thousands of miles of inhabited waters have contracted to a mere 175 or so miles between the Cochiti Dam to the headwaters of Elephant Butte Reservoir in New Mexico. Despite receiving federal protection under the Endangered Species Act in 1994, having been subject of multiple lawsuits, recovery plans and hatchery schemes, the remaining wild population continues to decline. And yet, the Rio Grande Silvery Minnow doesn’t ask for much, preferring silty backwaters to fast flowing depths. Insufficient spring flows for spawning and water quality impairments challenge recovery efforts in remaining habitats. The Silvery Minnow calls upon us to do better, to use water more efficiently throughout the American west, reduce the transport of pollutants from land to water, and maintain riparian corridors. For what is the fate of a river that can no longer provide for its native minnow, once numbering in the millions? There is a truth we must face; it will require more work to not only recover this species, but save the Rio Grande and ensure water security throughout America’s second largest watershed for humans and wildlife alike. The remaining wild population of Rio Grande Silvery Minnow resides not far from an aptly named city, Truth or Consequences, New Mexico.